I recently attended a single malt scotch tasting at the The Malt House in Madison. Scotch, for those novices like me, is malt whisky that was produced in Scotland. Scotland has 89 operational malt whisky distilleries. “Single malt” means that one hundred percent of the malted barley used to make the scotch came from a single distillery. Another fun fact: in Scotland, it is spelled “whisky” whereas in the U.S. it is “whiskey.” Like wines, scotch tends to be grouped by the region. At the tasting I attended, I tried scotches from three different regions: the Speyside region, where more than half of Scotland’s distilleries are located; the Highland region, with its mountainous terrain; and the Islay island region (pronounced “eye-la”), which produces scotches known for their peaty, dry flavor. The following is a list of the scotches I tried and my thoughts on their flavors. Full disclaimer: I am not a scotch drinker or a whiskey drinker of any kind, and this was my first foray into that realm. I tried to be brutally honest about the different scotches I tasted. If I note that I didn’t like it, it doesn’t mean it was not a good scotch. Some of the flavors I describe might sound great to someone with a developed palette. These are merely the musings of a scotch virgin. The Glenlivet 12 Year. I was told that this is a pretty standard single malt. It tasted a little bit like vanilla, with a boozy bite. Bottom line: a good scotch for beginners, though I wouldn’t crave it. 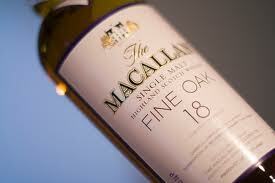 The Macallan 18 Year. This was the best scotch of the six I tried. It was smooth, dark in color, and tasted of caramel. It’s the only scotch that didn’t burn down my throat in an unpleasant way, but rather a smooth, tingly way. Bottom line: dangerous. Glenmorangie Quinta Ruban 12 Year. This scotch was sweet, and smelled like toffee. It is aged in port casks from Portugal, so you can taste some of the oakiness that comes from the wood. Bottom line: If you have a sweet tooth, this is your scotch. Ardmore Traditional Cask (NAS). I had to look up what NAS means. It means “no age statement.” It means the bottle can contain whisky of any age older than the legal minimum aging period which, for scotch, is three years and one day. This scotch was very “peaty,” which for me, came across as a smoky flavor that I didn’t care for, but apparently some people really like that flavor. Bottom line: reminded me of smoked turkey. Caol Ila 12 Year. This one is pronounced “kull-eela.” This scotch, like the Ardmore, had a smoky aroma reminiscent of sitting around a campfire. It tasted tangy and charred to me. Bottom line: Tastes carcinogenic. Lagavulin 16 Year. This one is pronounced “laga-voo-lin.” This was another peaty one, with an intense smoky flavor and a strong bite to the nose. Bottom line: I don’t get the appeal of peaty scotch and don’t think I could drink enough of it to develop a taste for it. All in all, I enjoyed tasting the different scotches, and came to the conclusion that the only one I really enjoyed and would drink again voluntarily was the most expensive one–the Macallan 18 Year. I guess I’m not alone. Whisky Magazine called it the “Best Malt in the World” in June 2004. At $165 a bottle, I don’t think I’ll be developing a scotch habit anytime soon. I’m not a fan of scotch, but I do like bourbon. Must be my southern roots. However, I can’t imagine a bottle of whiskey I would pay that much for. Champagne? maybe. Haha, I loved this post! Scotch is amazing. I have to admit, I did the scotch tasting mostly so I could write about it! Hope you enjoyed the bourbon. Oh Susan, it’s a dangerous path you are leading me down! After telling my husband about your bourbon/candy pairing he came home with a bottle for our own taste test. I don’t usually like booze, but with a dollop of water to kill some of the alcohol it was actually quite tasty. I’m sure he’ll be happy to give the Macallan a try! (although perhaps not so happy about the price). There’s a Whiskey Festival in Philly soon, maybe we’ll sign up. That is also my favorite scotch. For a tasty yet reasonably priced single malt I recommend Glenlivet 15.